Our complete line of bulk foodservice tomato soups are used in thousands of restaurant dishes. Trust the restaurant supply superstore for all of your cafeteria kitchen tomato soup and pastes. We stock every different type of tomato product available for restaurants and foodservice companies including tomato soup, tomato paste, pasta sauce, salsa and more. Campbell's At Hand Ready To Serve Tomato Soup 10.75 Oz. 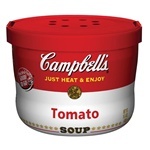 Campbell's Tomato Bowl Soup Red and White 15.4 Oz. Campbell's Healthy Request Tomato Soup 50 Oz. Campbell's Ready To Serve Easy Open Tomato Soup 7.25 Oz. 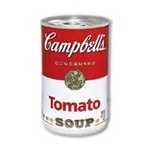 Campbell's Ready To Serve Low Sodium Tomato Soup 7.25 Oz. 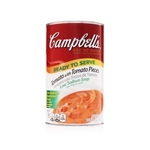 Campbell's Ready To Serve Low Sodium Tomato With Pieces Soup 50 Oz. 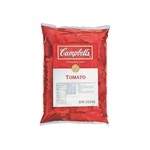 Campbell's Tomato Condensed Soup Pouch 12 Lb. Campbell's Tomato Soup 10.75 Oz. Heinz Tomato Soup - 51 Oz. Vanee Foods Condensed Tomato Soup - 50 Oz. Soup Du Jour Cream Of Tomato and Red Pepper - 17.1 oz. Knorr Soup Du Jour Tomato Soup Mix - 13.6 Oz. Allegro Tuscan Tomato and Herb - 105 Oz. Amys Organic Chunky Tomato Bisque - 14.5 Oz. Bulk Tomato Soups are used in many different restaurant dishes and is served ala cart in salad and soup bars as well.